Doctor Francis Ardan, intrepid explorer and polymath, was created in the 1920s by French writer Guy d’Armen for the French pulp magazine, L’Intrépide. After publishing three of his novel-length adventures in English, we offer here four original short stories taken from the pages of L’Intrépide, in which see the fearless hero tackle a Yeti, a Witch Doctor, a vampire and a giant bat. 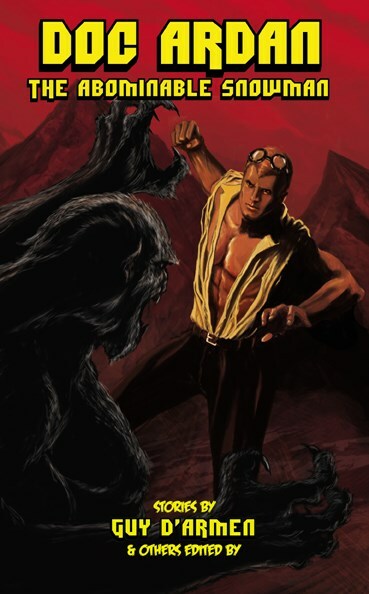 In addition, this collection contains twelve other stories, including four written especially for this volume, in which Doc Ardan faces such exotic threats as the Beast of Gevaudan, the Queen of Atlantis, Natas the Devil Doctor, the Morlocks and more. The book also includes a new listing of Ardan stories and “Before the Bronze Age,” an article revealing the connections between Ardan and a world-famous bronze hero. 3. The Vampire of the Hamada. John Peel: The Biggest Guns. Jean-Marc Lofficier: The Star Prince. Vincent Jounieaux: The Dreadful Conspiracy. Christopher Paul Carey & Win Scott Eckert: Iron and Bronze. Win Scott Eckert: The Eye of Oran. Win Scott Eckert: Les Lèvres Rouges.